3 Food Stocks with Better Dividends than McDonald's Corp.
McDonald's has a well-deserved reputation as a solid dividend stock, but there are better food industry options for income investors. McDonald's (NYSE:MCD) has long been known as a solid dividend-paying stock, and it's a favorite among income investors. The leading fast-food chain is among the select list of S&P 500 Dividend Aristocrats -- stocks that have raised their dividend at least once annually for at least 25 consecutive years. McDonald's first began paying a dividend in 1976 and has raised it annually in the 40 years since. With a 3% yield it offers a better payout than the average S&P 500 dividend payer, and has a track record that only a few stocks can match. Its franchise model helps ensure a steady cash flow even during weaker periods, buffering it against downturns and recessions. However, there are reasons to question the future of McDonald's dividend. After raising it by 10% every year from 2002 to 2012, for the last three years, management has lifted the payout by just 5% annually. Its dividend payout ratio has also reached 70% during that period, meaning it will need to grow profits in order to justify lifting its dividend, which it had struggled to do until its most recent quarter. Based on its current P/E ratio of 25, investors are already paying a steep premium for a low-growth dividend stock. On that note, here are three other options that dividend investors might want to consider. As the nation's largest egg producer and distributor, Cal-Maine Foods (NASDAQ:CALM) is a key supplier to McDonald's -- the fast food chain is one of the country's largest buyers of the breakfast staple, purchasing 2 billion eggs each year. Cal-Maine has grown through acquisitions to control 23% of the domestic egg market, and is focusing on increasing its production of higher-value, cage-free eggs as more corporations -- including McDonald's -- have pledged to use only eggs from cage-free hens. Cal-Maine stock has also been a big winner on the market as the chart below shows. As you can see from the graph above, the company has an unusual dividend policy. Instead of making a steady payout like most companies, It pays a variable dividend, equal to a third of its net income in each quarter. The company adopted that policy because of the cyclical nature of the egg industry. Recently, with egg prices elevated due to last year's major avian flu outbreak in the Midwest, Cal-Maine's yield spiked to 6%, based on its last payout. While Cal-Maine's dividend doesn't offer the consistency of McDonald's payout, it currently offers a better yield, and with the transition to cage-free eggs, the company's growth prospects seem promising. For a more stable dividend play, B&G Foods (NYSE:BGS) is a solid option. The maker of a wide variety of shelf-stable food products, including canned beans, canned meats, and pickles, has a large brand portfolio that boasts household names like Cream of Wheat and Ortega. B&G also boasts a respectable history as a strong dividend payer. Like McDonald's, it's a defensive stock that investors can count on to deliver results even in down markets. B&G shares have surged since the recession -- they're now worth more than 10 times what they were when they hit their 2009 low -- and have maintained a dividend yield of at least 3.6% throughout that period. The company just announced a 20% hike in its quarterly dividend to $0.42 a share, giving it a yield of 4.5%, based on the current share price. CEO Robert Cantwell credited the strength of the base business and its recent acquisition of Green Giant for the company's strong cash flow and dividend increase. "Dividend growth remains a key component of B&G Foods' total shareholder return," he said. Like McDonald's, B&G trades at a high P/E ratio and has a payout ratio, but its yield and dividend growth rate make it the superior dividend stock. Starbucks (NASDAQ:SBUX) may seem like an odd addition to this list. After all, the coffee giant is a relative neophyte in the dividend world and offers just a 1.4% yield. However, its dividend growth potential is much greater than that of McDonald's. For investors with longer time horizons, Starbucks looks like the better play. Five to 10 years from now, it's likely to offer the better payoff. Since the coffee chain first offered a dividend in 2010, its value has increased four times, rising from $0.05 a quarter to $0.20. Starbucks has hiked its quarterly payouts every year, increasing them each time by at least 20%. Even so, Starbucks' dividend payout ratio is just 33%, indicating that it could afford to pay the same dividend yield as McDonald's if it chose to. Starbucks' growth path also appears much brighter than McDonald's. The company plans to open 500 stores every year in China for the next five years, and could easily pass McDonald's in revenue, profits, and market cap in that time span. Growth like that should enable the company to continue raising its dividend by around 20% a year. If it's able and willing to do so, it will match McDonald's dividend yield in five years, assuming Mickey D's continues its 5% increases. Finally, investors must remember that the actual yield they get is based on the price they paid for the stock, not its current price. 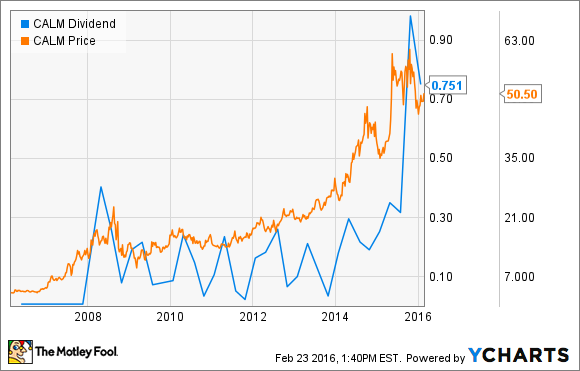 By that logic, Starbucks looks like the better dividend stock over the long run.